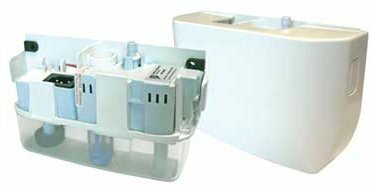 Designed to be fitted below the indoor unit, the Mini Blanc offers an extremely easy to install Mini pump for all wall and ceiling suspended indoor units. Suitable for both commercial and domestic installations, the quick fit pump is simply screwed to the wall. It is easy to access therefore low maintenance. The Mini Blanc is ultra quiet in operation as well as discreet, with a slim profile of 55mm from the wall. By connecting the drain hose to the reservoir and placing the pump drive unit within the evaporator, condensate water can be pumped away to a suitable drain. Within the Orange kit there are two reservoirs to choose from, which must sit flat and horizontal. One allows you to connect directly to the drain hose of the evaporator and the second reservoir can be placed directly into a condensate tray. The Aspen Mini & Maxi Lime pumps are completely unique, in both their design and installation advantages. The pumps are clipped directly onto the reservoir so there is minimal suction lift. By connecting the drain hose to the reservoir of the pump unit, condensate water can be pumped away to a suitable drain. The pumps fit securely into a specifically designed elbow that holds them horizontally to ensure reliable operation. The pump and elbow are reversible therefore they can be installed easily on either side of an evaporator unit. The Lime system makes installation easy by providing a pump complete with the conduit trunking, in which the pump and all pipework are hidden. This system allows easy access for maintenance and ensures that the reservoir is level at all times.